When it comes to selling a product, shipping supplies are a very important aspect in the sales cycle. Sure, making the sale is crucial, but ensuring that the product is delivered safely, and in the condition the customer expects is just as important. 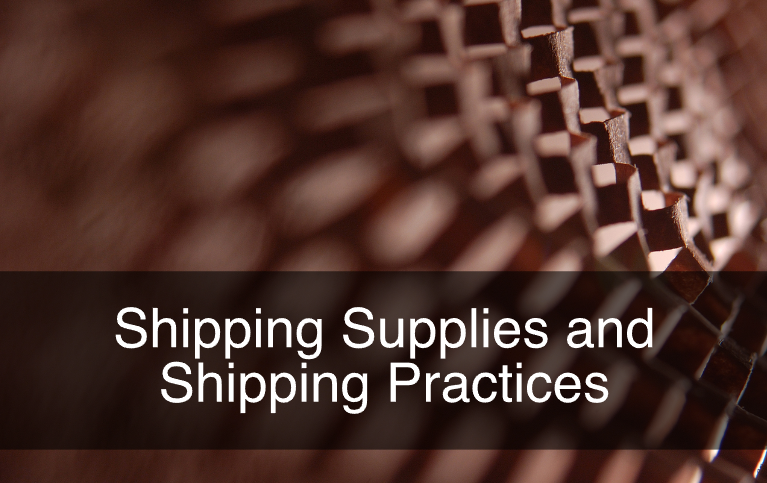 In this post we will discuss good practices for shipping, and the supplies used in this process. Depending on the fragility of a product, some items require special shipping supplies to ensure it arrives at its destination without any damage during transport. In order to protect a product during shipping, a number of supplies can be used. Bubble wrap is great for protecting products by creating cushioning. After the product is bubble wrapped, it could be placed in a bed of packaging peanuts inside the cardboard box. Another way to create cushioning is by wrapping items in single face corrugated cardboard. The ridges in this material creates great protection. Furthermore, some times it is good idea to double box a shipment. All of these accessories, will ensure a successful delivery. If you are in an industry that requires special consideration when packaging products, never neglect its packaging rules and guidelines. Always ensure that every precaution is taken. Here is the link to the Guide to the Consumer Packaging and Labelling Act and Regulations. Avoid shipping boxes that are not entirely full. Products might shift in the box and can potentially get damaged. Also, heavier boxes might be placed on top of it, which could crush it and damage its contents. If an order does not fill up a box entirely, there are a number of options you can use to ensure that the box is full. Supplies such as newspaper, kraft paper and packing peanuts, are commonly used to fill up boxes. A very important aspect in shipping, is to always ensure that the product will make it to its recipient undamaged. We should always ensure that the boxes are sealed properly. Filament tape is most commonly used for this. Always wrap your pallets to avoid a stack to fall during transportation. Ensure that all of the boxes in the pallet are wrapped. At ibox Packaging, we are industry experts and are always happy to assist you with any shipping need. For more information, or questions about shipping supplies or protective packaging please contact us. Also, sign up to our newsletter for more information, company updates, price specials, and more.